It’s Preservation Week! This week, we are looking at the daily life of a conservation department and the work we each do in support of the library and its mission. 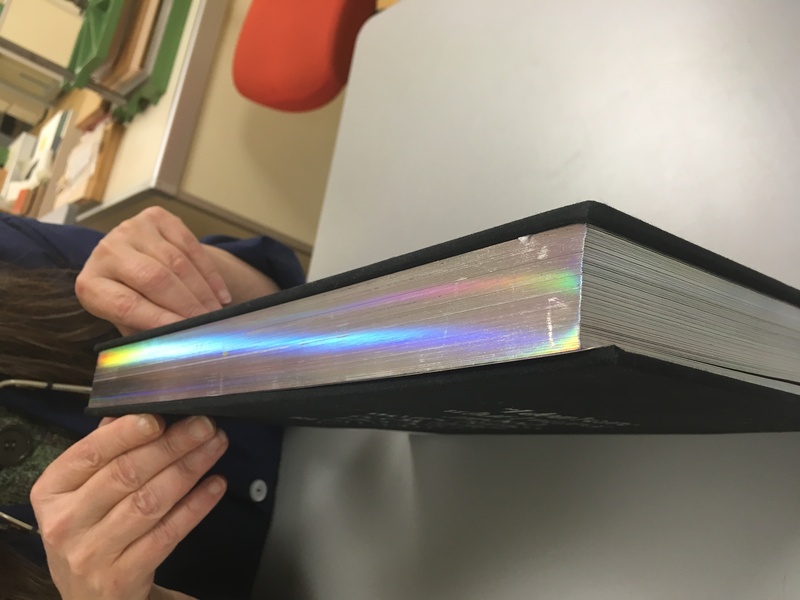 On Monday, Mary was repairing a book with very cool end papers. On Tuesday, Beth was in a meeting (surprise!). Sometimes you need to bring in expertise when faced with a particular challenge. 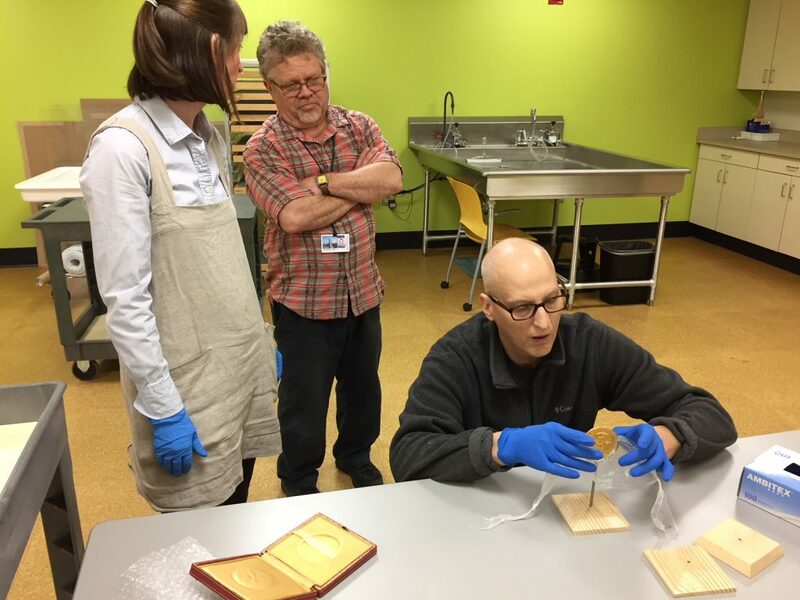 Rachel is working with Brad Johnson and Patrick Krivacka from the Nasher Museum of Art to build a custom mount for Kenneth Arrow’s Nobel Prize medal. Today was the medal’s first fitting. They also discussed the finish for the stand and came to agreement on the height of the frame. (L to R) Rachel Penniman, Brad Johnson, and Patrick Krivacka discuss the fit of the display stand. Kenneth Arrow was an economist, professor, and Nobel laureate. Arrow’s career is especially distinguished by his contributions to the theory of social choice, including his book Social Choice and Individual Values, published in 1951, and his contributions to general equilibrium theory. For these achievements, Professor Arrow has been awarded the Johns Bates Clark Medal (1957) and the Nobel Memorial Prize in Economics (1972), which he shared with Professor Sir John Hicks. We are very excited that we will have a custom-fit stand so that the Nobel medal can be displayed in classes, show and tells, and exhibits. Thanks Patrick and Brad! It’s Preservation Week! This week, we are looking at the daily life of a conservation department and the work we each do in support of the library and its mission. Yesterday we saw Mary in repairing a book with very cool end papers. As a department head my job is to make sure we have the budgetary and human resources that we need to do our work, advocate for my staff and department, and make sure our priorities fit into the strategic direction of the library. To that end, I attend a lot of meetings. Technical Services department head meeting. Duke Libraries has a culture of collaboration, so we do a lot of talking with each other. My standing meetings include departmental and individual staff meetings; Technical Services Department Head meetings; meetings with my supervisor; the monthly all-library staff meeting; the Multi-spectral Imaging team meeting; quarterly division meetings; and meetings with other department heads outside of Technical Services usually over lunch or coffee. Then there are special meetings that are called around projects or initiatives, budget setting, and other administrative duties. Then there are the meetings that happen on the fly at the bus stop, in the hallway, or in the cafe line. By attending these meetings I am gathering the information I need for the department to be successful, I’m building relationships across the library, and I am also finding out what is happening in other departments that might impact our workflow. 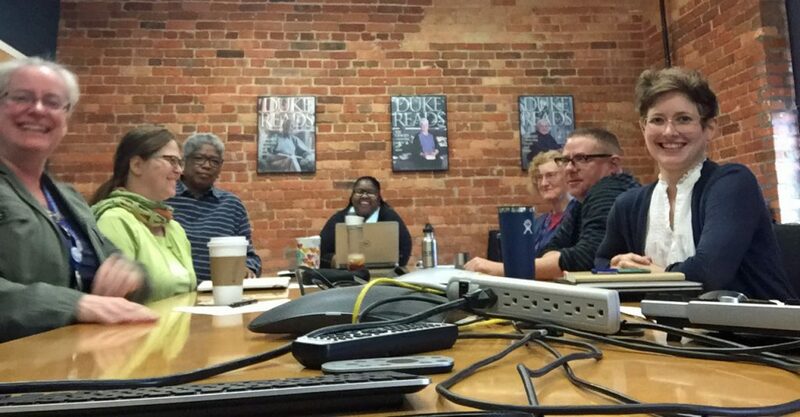 I know for some people all these meetings sounds like torture, but I rather enjoy getting together with colleagues to think about our collaborative future. And sometimes you get doughnuts. It’s Preservation Week! In an effort to raise awareness of the need for preservation of all kinds, every day this week we will highlight one of the many ways our staff support collections at Duke University Libraries. Our first stop is the circulating collection. 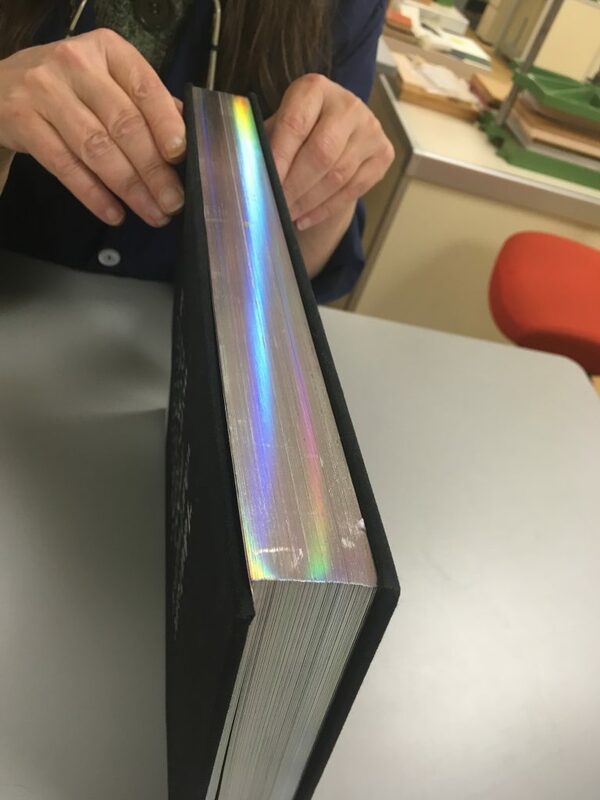 Today Senior Conservation Technician Mary Yordy is working on a mesmerizing book in need of some help. 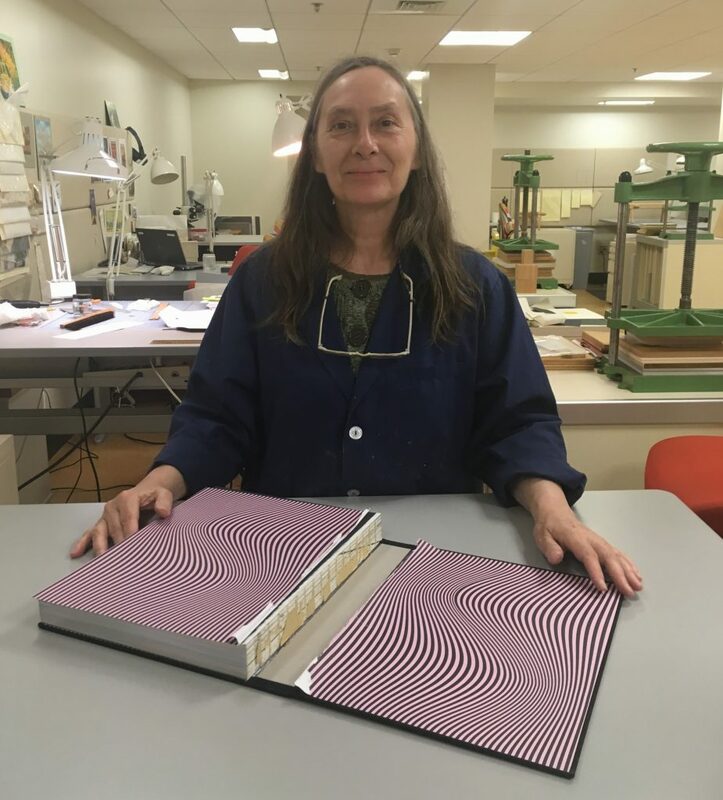 This visual album about Barneys New York shows a common problem with modern art books: the flimsy case construction of the binding just doesn’t stand up to the weight of the textblock. 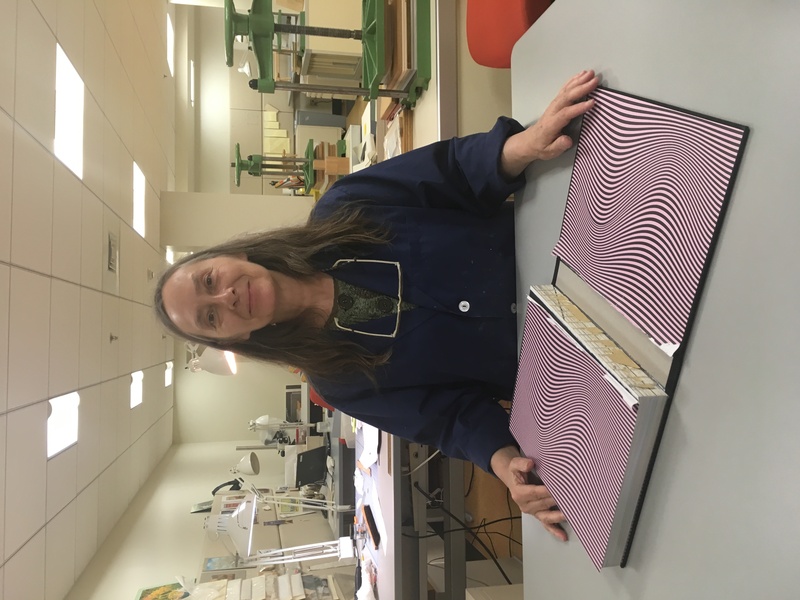 While it is down here in the lab, Mary will repair the rear hinge of the book, rejoining the text to the binding and allowing it to function again for many more circulations. The publisher of this item really went all out with the endpapers and “chameleon” metallic edge treatment! When: Wednesday, April 24, 4:00 p.m. In 1991, from a basement in lower Manhattan, contemporary artist Wolfgang Staehle founded The Thing, an electronic Bulletin Board System (BBS) that served as a cyber-utopian hub for NYC-based artists integrating computers and into their creative practice. The Thing emerged at a moment when contemporary artists were coming to grips with personal computers and the role they played in visual art. The BBS, which began as a temporary experiment, grew to become an international network of artists and ideas. Then the World Wide Web emerged and in 1995 Staehle abandoned the BBS for a web-based iteration of The Thing. The cultural record of these crucial early years, inscribed on the platters of the hard drive that hosted the BBS, was left to sit in a dusty basement. Fast forward to 2013. Digital conservator Ben Fino-Radin reached out to Staehle to investigate the state of the BBS. Did the machine that hosted The Thing still exist? Could the board be restored to working order? For scholars interested in the intersection of art and technology, the ability to investigate the contents of the BBS and observe its original look and feel would help flesh out the history of the emergence of personal computers and visual art. Unhappily, it was discovered that the computer that hosted The Thing BBS was at some point discarded. Join Ben Fino-Radin on Wednesday, April 24th, to discuss the process of digital forensics, investigation, and anthropology involved in the process of restoring The Thing BBS from the scattered bits and pieces of evidence that managed to survive, and how this story serves as a case-study in the need for a new model of digital preservation in archives. 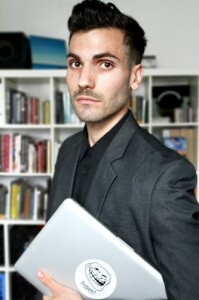 Ben Fino-Radin is a New York-based media archaeologist and conservator of born-digital and computer-based works of contemporary art. At Rhizome at the New Museum, he leads the preservation and curation of the ArtBase, one of the oldest and most comprehensive collections of born-digital works of art. He is also in practice in the Conservation Department of the Museum of Modern Art, managing the Museum’s repository for digital assets in the collection, as well as contributing to media conservation projects. He is near completion of an MFA in digital arts and MS in Library and Information Science at Pratt Institute. He holds a BFA in New Media from Alfred University. Provide who/what/when/where for photos and documents. You can write on the back of photos or documents lightly with a pencil, or take a digital image and add the information to the digital file. Be sure to put these in a safe location, or transfer the files regularly. Take things out occasionally and inspect them for mold and insect activity. Be sure they are clean and have no damage. Label enclosures adequately so you know what is inside. This will also reduce rumaging through boxes to find what you need. Rotate displays to give items a break from being out, and to show off other items. This gives you a chance to inspect items regularly, too. Document items for insurance purposes should disaster strike (describe valuables and take pictures of them, perhaps part of a home inventory). 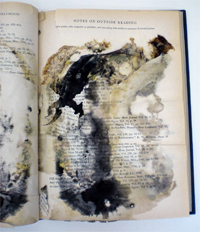 Sure, you can tape book pages together or attempt DIY book repair, but if your collection is valuable to you sentimentally or monetarily, it is best to consult a professional conservator. A good conservator will give you a range of options from an enclosure to full treatment and should be able to discuss with you, in plain English, what your choices are and how they will affect your material. Do not be afraid to ask questions. We conservators love to talk business. We also love to talk food…but that is a completely different blog post. We hope you have enjoyed our Preservation Week blogging. If you have learned something new or taken any advice, we would love to hear from you on what you did to protect your personal collections. We wrote about disaster preparedness for our May Day post. You should have a plan for yourself and your family in case of an emergency. And you should have one for your collectibles in case they are also affected. We won’t list all the resources from our May Day post, but here are some that address personal collections. So far our posts have dealt mostly with paper-based materials. We of course collect a lot of other things, too. All collections benefit from a controlled environment and good handling practices. While we do not have room here to address all non-print media, here are some tips for the common items in home collections. A good place to start looking for information on non-print materials is the AIC Specialty Groups. Many of the dyes in textiles are sensitive to alkaline (basic) conditions. If you are choosing enclosures for your wedding or christening gowns, baby clothes and other textiles, choose enclosures and wrapping materials that are pH neutral. These can easily be obtained by perveyors of quality conservation supplies such as Gaylord Brothers, University Products, or Talas. Listing does not imply endorsement of any product or vendor. Textiles are also very sensitive to environmental conditions. Food stains can attract hungry insects and high humidity can accelerate decay and attract mold. If you display textiles, but especially sure they are not exposed to light and pollutants (cooking vapors, dust, etc.). Cleaning should be undertaken very carefully and follow established conservation guidelines (read: consult a professional). See the AIC Textiles Specialty Group page for some good information. Photos and film are very sensitive to the environment around them. Dust, light, pollutants, and handling can cause irreparable damage. As with textiles, some photographic processes can be alkaline sensitive. While you will find debate on this, if you have a choice we recommend pH neutral enclosures. If all you can find are alkaline enclosures, they are better than no enclosures at all. Good quality film cans come in acceptable plastics which do not rust. We also recommend creating high quality facsimiles if you have important photographs you want to display, and you can digitize your home movies so you don’t have to play the originals. Obviously do not throw away the originals once you reformat them. We are creating digital materials at a fast clip these days. Photographs, documents, electronic scrapbook pages. These are all very fun and convenient for sharing and displaying, they are also very vulnerable. 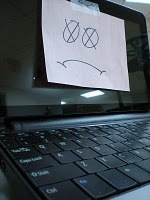 Digital documents are vulnerable to format and hardware obsolescence (video tape and CD’s are soon to be obsolete), chemical instability, and unpredictable and often complete failure. For this reason we often recommend creating backups often and in the most current formats. For instance, if you have a lot of home movies on VHS videotape, it is time to transfer them to DVD or MPEG format. Lots of Copies Keeps Stuff Safe. That is our mantra. Make digital copies, send them to family members, even print out documents now and then and put them in a safe place. Be sure to transfer your electronic documents each time you update platforms or software versions. Do not eat or drink around collections. Food and drink, even water, can cause permanent staining and can attract insects, mice and other undesirable critters which in turn may feast on your family bible. Clean your hands and dry them thoroughly prior to using your collections or you may leave stains and food debris behind. This is especially true for photographs and textiles which are very sensitive to the oils and dirt on our hands. Make sure you have a place to put it. Before removing a book from the shelf or your mother’s wedding dress from the linen closet, make sure you have a clean, spacious area to lay it down. You can’t clear clutter when your hands are full. Don’t pull books from the shelf by their head caps, don’t drag your mother’s wedding dress along the floor, don’t put fingerprints all over your photographs and don’t use your Grandmother’s fine bone china as frisbees. Avoid paperclips and sticky notes, too. For Pete’s sake, use some common sense and handle your stuff with care and respect. Light exposure causes fading and embrittlement of paper, photographs and textiles. If you hang things on your walls, keep them away from windows and lights. Before hanging, watch the sunlight patterns on the walls as the day progresses and note where direct sunlight falls. Then hang your pictures in places that don’t receive light. See our previous post on controlling the environment. Don’t hang the only photograph of Grandma in the bathroom or keep it in the attic. She will come back to haunt you if you do (at least that is what my Mom says, and she is always right). Any materials that come in contact with your collections should be made of the best quality materials and should not cause damage. When taking your photos and family papers to be framed, be sure to ask what the pH of the mat board is, what kind of glazing is used (glass or Plexiglas are good choices), and how the item will be attached to the backing (non-adhesive methods are best). If you have only one of something to use or display, it might be a good idea to have a high quality reproduction made so you can work with that instead of the original. This way you can put the original inside a good enclosure and in a safe location. This is a great idea for things like birth records, family trees from the front of your bible, photographs, children’s drawings and especially for newspaper articles since they are so quick to turn yellow and brittle. If you can do just one thing to protect your collections you would be wise to choose controlling the environment. What does that mean exactly? In Preservation terms, it means 60-70 degrees Farenheit and 40-50% relative humidity with minimum fluctuations in either. It also means keeping light and pollutants out of collection areas as much as possible. Providing this environment reduces the rate of organic deterioration, keeps bugs and mold at bay, and limits exposure to potentially harmful light and dust. We live in the real world and understand that not many people (let alone institutions) can maintain such strict conditions. So what can we do at home? Keep your materials in a stable environment. Large fluctuations in temperature and humidity (more than 5 degrees or 5% rH) are worse than being in a slightly warmer or wetter environment that is stable. Store your materials where you live. Do not store important items in the attic or basement, and definitely not out in the shed or garage unless these environments are controlled. Keep materials off of the floor. Store items at least six inches off of the floor to avoid water damage from water and insects. Watch for fading and warping, or evidence of pests and mold.You can purchase inexpensive monitors at your local electronics store that tell you the temperature and relative humidity. If you discover a problem, contact a professional conservator for advice immediately. Enclosures provide protection from light, dust and handling. We think they may provide a microclimate that can may mitigate small fluctuations in temperature and relative humidity. We have also seen boxes that have gotten wet wherein the contents have been dry, the box having soaked up the moisture before getting to the contents (do not count on this as your disaster plan, however). An enclosure can be a box, envelope, folder or picture frame, anything that provides protection from the elements. What makes a “proper” enclosure? An enclosure should be just slightly larger than the contents. If it is too small, it may cause damage (think of shoes that are one size too small, ouch). If the enclosure is too large, the contents can move around and bash into the sides. This is particularly bad for brittle and fragile items. What the enclosure is made of matters, too. Enclosures are usually made of paper or plastic, choose based on whether you need rigidity and light protection (paper) or need to see through the enclosure to reduce handling (plastic). Enclosures made of paper such as folders and boxes should have a pH between 7.0 and 8.5 and be lignin free. 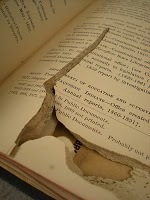 * Acidic and lignin-containing enclosures can cause paper to become brittle and discolored. Plastic enclosures such as slide or page protectors should be made of stable, preservation-quality plastics. These are polyester (trade names Mylar and Melinex), polypropylene and polyethylene. If you can’t determine what type of plastic it is, don’t buy it. Avoid vinyl because it offgases and causes discoloration and brittleness. *Warning: When choosing enclosures from vendors you must be an informed consumer. The term “Acid Free” is a marketing ploy and does not tell you if the chemistry of the materials will harm or protect your artifacts. Think about it…would you put your priceless artifacts into a bath of drain cleaner? After all, most drain cleaners are “acid free” because they are very strong bases. So strong they can dissolve whatever they come in contact with. If you are unsure of the actual pH, ask the manufacturer or choose something you know is safe. When in doubt, choose a pH neutral (pH of 7.0) container. Today starts the first ever Preservation Week brought to you by ALA’s Association of College and Research Libraries among others. This idea stems from a 2005 national survey of repositories by Heritage Preservation in partnership with the Institute of Museum and Library Services. Among the findings: 26% of the responding institutions have no environmental control for their collections; 80% of responding institutions had no emergency plan that included collections; and 77% of institutions do not allocate funds in their budgets specifically for preservation. These numbers are eye opening, but we at Preservation Underground also know that there is a lot to do within our personal collections to ensure the longevity of our own collections. 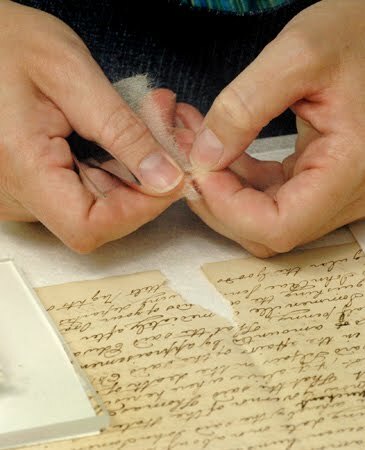 During this first ever Preservation Week we will bring you tips to help you do just that. These tips will focus on books, paper and photographic documents. Later in the week we will touch on textiles and digital materials. 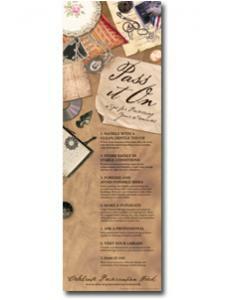 The theme “Pass It On” is applicable both to our personal collections and to our personal stories. Do you have a preservation story to tell? We would love for you to share it with us, pass it on.